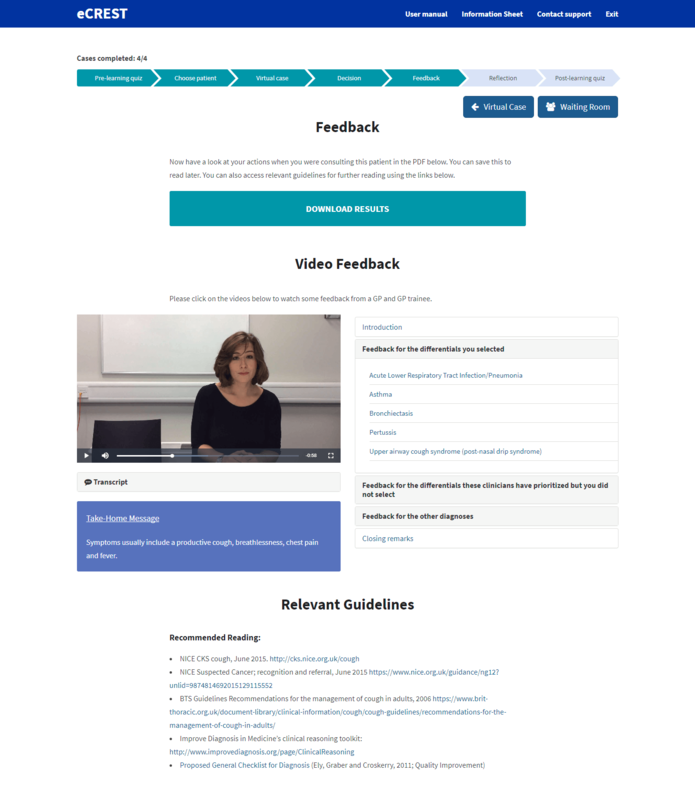 We were commissioned by UCL's Department of Applied Health and Research to build a new online learning tool called eCREST. This project involved a multidisciplinary team including UCL medical school tutors, GP registrars, health psychologists and experts in public health; with input from medical students, experts in medical education, primary care diagnostics and health care evaluation. 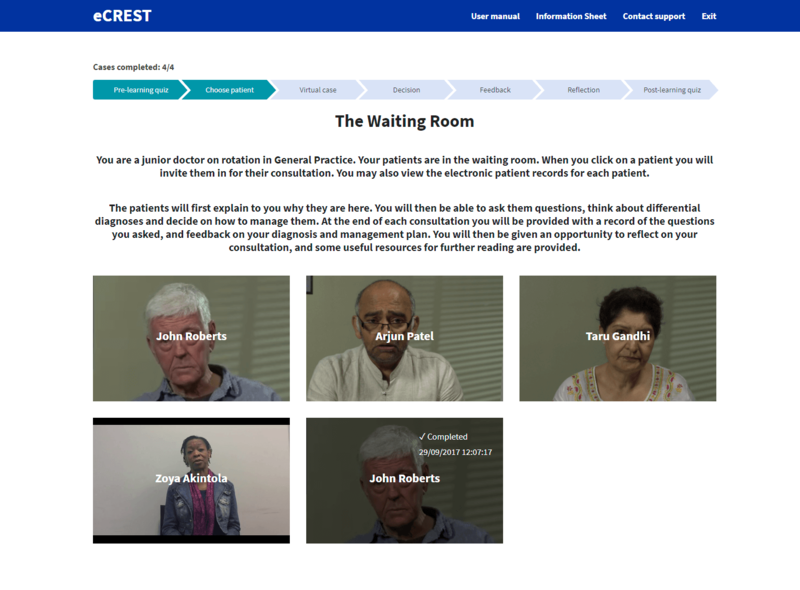 eCREST simulates real consultations between a junior doctor and a patient in General Practice, in which the ‘patients’ are presenting to their GP with respiratory symptoms. The overall aim of the project is to test whether using eCREST can improve clinical reasoning in this context. In the 'Waiting room' users are given a selection of patients to consult with. Once they have chosen a patient, they will proceed to the 'Virtual case' section. They are also able to open previously completed consultations for their own analysis. The 'Virtual case' provides a range of categorised questions, clicking on a question automatically plays a video of the patient's response. Users are additionally given access to the patient's electronic records and the ability to take notes with an online notepad. Throughout the 'Virtual case' and on completion of this section, users are required to rank their top 5 diagnoses. The collection of questions asked by a user and their chosen diagnoses are saved in a database for later evaluation of the eCREST tool. Users are provided with a downloadable PDF summarising their consultation with the patient. There is also video feedback from GPs regarding the user's diagnoses and the likelihood of being correct. Send us your project details and a friendly member of Silver District will get back to you as soon as possible.